The essence of luxury in every detail. The beech wood legs are available in two shades, bleached or stained wenge, and offer elegant chromatic combinations, for a more classic and refined look or a more modern and provocative one. The bleached beech is offered with a linen-coloured body together with transparent, pistachio green and translucent green or in anthracite mixed with transparent; wenge stained beech is offered with the body in taupe together with transparent. 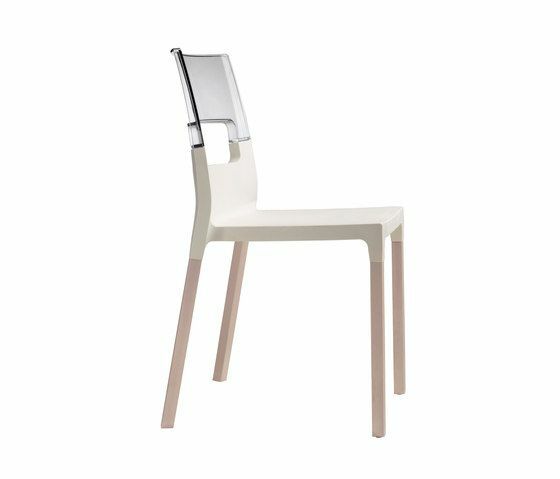 Diva has fibreglass reinforced polypropylene seat, a translucent polycarbonate back and beech legs with a 27x27 mm square cross-section. It is stackable and suitable for indoor use.